In addition to the pre-conference workshop presented by Andy Priestner and Matt Borg, there will be 5 workshops presented during the conference proper on Day 1 by (from left to right above): Bryony Ramsden, John Jung, Eva Jirjahlke, Carl Barrow, Shelley Gullikson. Delegates will be able to attend 2 of these workshops (we will ask for your selections next month). The workshop titles, summaries and anticipated learning outcomes are as follows. Summary: Collecting data with your new-found UX techniques is all well and good, but what do you do with the data once you have it? Data analysis can be an intimidating process, particularly if it is a long time since you qualified, or if your education didn’t cover research methods or data analysis. This workshop will introduce some basic manual techniques to help you get started on analysing qualitative data, covering how to code data and organise findings thematically. You will also have the opportunity to put these techniques into practice by analysing and organising some sample data. Attendees will be provided with some UX data to work with. Learning Outcomes: Attendees will learn the different ways of analysing qualitative data (manually or using computer software (CAQDAS)); how to manually code data; organising codes into themes; the pros and cons of collaborating to analyse data; the challenges of dealing with large sets of data. Summary: So often, designers work to create products that are sleek or interfaces that are easy to use. The underlying values behind this kind of work are often highly commercial – the goal of design is to encourage consumerism. Speculative design offers an alternative. If you are familiar with television programs like Black Mirror, Westworld, or Humans, you are already familiar with some elements of speculative design- the thought-provoking narratives in these shows are designed to spark conversation around current technical and social topics. Designers doing speculative design projects are using design as a way to ask questions and facilitate conversations around challenging topics. At their best they are using design to incorporate diverse perspectives around possible, shared futures. In this workshop we will look at some examples of speculative design and we will participate in an activity inspired by speculative design. All the while the workshop will be a chance to ask, “How might techniques like these help facilitate conversations about inclusivity? How might they be useful in libraries?” These projects incorporate objects, narratives, games, and more- so workshop participants who are interested in the creative aspects of art, writing, and design may find speculative design especially inspiring. Additionally, because speculative design is so often incorporated into design workshops, participants who create UX workshops and activities for end users will find useful material here as well. These projects experiment with ways to create engaging workshop experiences. They offer a huge range of approaches to borrow from or build upon. All are welcome, and no prior knowledge of speculative design is required. People with diverse backgrounds, and who bring diverse perspectives, are especially invited to participate. Let’s have a conversation about speculative design. Learning Outcomes: Participants will: become familiar with speculative design as an area of practice; experience a workshop activity inspired by speculative design; reflect on possibilities for speculative design in libraries, as a group; receive a list of secondary resources to explore this topic further. Summary: By now you have done some user research and have identified a few problems that disrupt your users’ experience. But how do you best solve them? How do you make sure you’re solving “the right thing”? And what do you do about those stakeholders who think they already know what the right solution needs to look like? Find out how to tackle a problem and rapidly prototype ideas to solve it in this interactive workshop. User needs: What needs are you trying to meet with your product or service? User goals: What are the users trying to achieve? Constraints: What are the constraints (budget, user behaviour, stakeholders) we might need to consider while designing our product or service? Context: Where and when are users using your product or service? Learning Outcomes: By the end of the workshop you will know how to: approach and break down a problem; rapidly prototype your ideas and consolidate them into a solution; communicate your ideas. You’ll get the opportunity to explain the problem and your solution to the group which will help you think about how you might sell it to your stakeholders later on. …And of course have fun while doing it. Summary: We live in two worlds, the physical and the digital. Most of us possess hand held devices that move us between those worlds. We can travel the globe with our friends and colleges without even leaving our homes or offices, we can be part of their experiences and they part of ours. We hear what they hear and see what they see, we interact with and enhance their experiences. We transition between these worlds with ease, and are even present in both simultaneously as they layer up and collide. This is also true for our library users. Our knowledge and understanding of how they use and experience technology, alongside that of their behaviours and feelings is an integral element of service and space development. And along with group discussion, help participants reflect on their own practices and the positive and negative impact that technology and electronic devices have on their lives. We will consider how these tools can be used to gain a deeper insight into the behaviours of our library users and the impact that technology has. We will also consider how, by cross-referencing with other data sets and other UX methods we can build insightful user stories to inform the decisions we make, allowing us to deliver our services with the right entry points and our worlds collided. Learning Outcomes: Attendees will: reflect on their own UX research activities; consider the impact of technology on user experience; learn how to conduct cognitive mapping and diary study research effectively; learn how to build user stories to inform decision making. Summary: Much of our work in library UX involves trying to create a smoother user experience. Our users are too often slowed down by the unnecessary friction of our overly complicated processes. They chafe against wordy and jargon-filled websites. They struggle to navigate spaces with overwhelming and unhelpful signage. Sometimes it seems like there is an unending amount of friction to remove in our libraries. However, there are times when friction can actually be a good thing. A bit of friction added to a process can slow down users at the right moment. Think of the false alert of a missile attack in Hawaii earlier this year. A bit of extra friction in the interface design of the notification system might have prevented it. Your users won’t ever make an error this enormous in your library, but still, there are times when you might want to shift them out of autopilot and have them pause. Many of our processes don’t require that pause, but it may be that what seems to be a smooth UX isn’t smooth at all for certain groups of users; a little design friction may help create a more inclusive user experience. You also might use friction to slow down your staff in order to improve things for your users. Finally, friction can also be beneficial not just in UX design, but in your user research. This workshop will help you explore where adding a little friction could help improve the user experience in your library. Learning Outcomes: Attendees will: understand how friction can be useful in both online and physical UX; explore useful friction in library UX by rethinking current services, workflows, and spaces; explore improvements to inclusion in libraries by adding friction; explore appropriate situations and techniques for adding friction to user research. 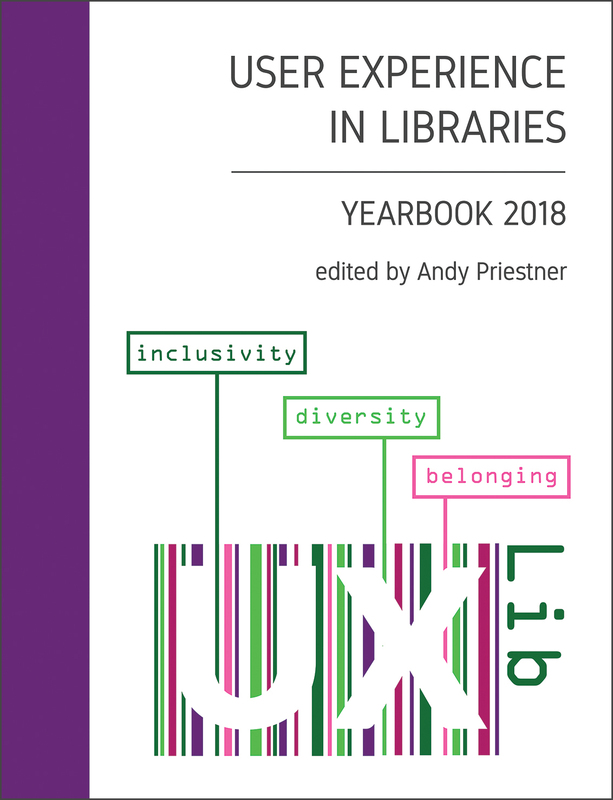 UXLibs 2018 Yearbook out now!